Mercedes-Benz E-Class Estate Performance, Engine, Ride, Handling | What Car? That said, neither of 2.0-litre units is the smoothest engines of its type – for that, you’d need the 2.0 TDI 190 in the Audi A6 Avant. And if you fancy something silkier in an E-Class, you need to move up to the six-cylinder E400d. This is a super-refined engine and pretty quick, enough that it’ll breeze you past slower traffic, although the trade-off is that it’s quite pricey to buy and run. If you’re tempted by the fuel economy offered by the diesel hybrid E300de - beware that the extra weight of the battery hasn’t helped its handling, and although it’s quick the diesel still sounds gruff. There's also a 2.0-litre four-cylinder E200 petrol that we've yet to try it in the E-Class Estate, but it's actually a little slower than the diesel E220d on paper, and costs almost exactly the same amount to buy. We'd stick with the diesel. If pace and power are your main concerns, you need to look at the AMG range, starting with the E53 4Matic. Unsurprisingly, with a 429bhp 3.0-litre turbocharged petrol V6, it’ll fling you down the road mightily briskly; 0-62mph takes just 4.5sec. It also has a mild hybrid system that all but eradicates turbo lag, so the throttle response is impressively sharp. There will be a crazy few, though, who believe the E53 isn't quite quick enough. It isn't a full-blooded V8 AMG engine, after all. If that sounds like you, check out our dedicated review of the full-fat AMG E63 S model, complete with 4.0-litre V8s turning out up to a mind-boggling 603bhp. 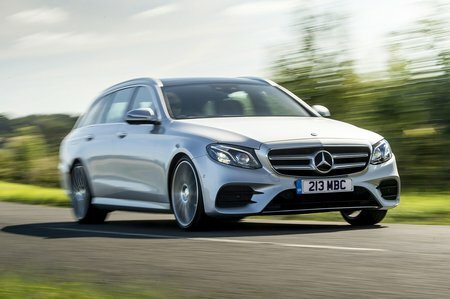 As standard, regular E-Class Estate models have self-levelling air springs at the rear and conventional springs and dampers at the front, which provide a supple ride on SE models. AMG Line trim, though, introduces firmer settings that give the ride a bit more shake and shimmy over rougher surfaces, but don't make travel unbearable. In either case, it's worth test driving a car with the optional air suspension; it’s an expensive upgrade, but it delivers a dramatic improvement to the ride. 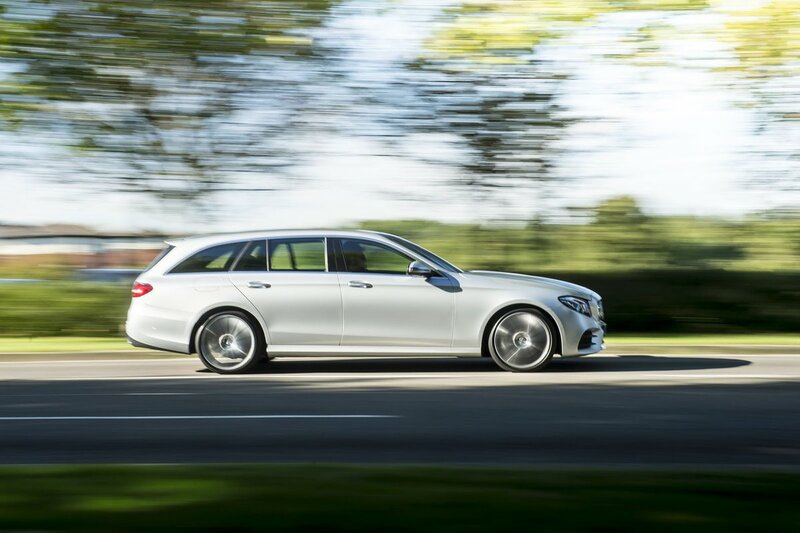 Thus equipped, the E-Class Estate wafts you along at speed in a manner absolutely in keeping with its luxury image. It’s still not perfect – there's an occasional thud when a razor-edged crag will catch it out – but it still makes for one of the best-riding estates out there. The AMG E53 and E63 S models use specially tuned suspension that's firm but not overbearingly so considering the cars' performance intent. They both offer a plethora of driving modes to alter the stiffness of the suspension as well. In Comfort, they do a respectable job of soaking up everyday rough road imperfections, even if they are still on the firm side at low speeds. In Sport Plus, meanwhile, you'll remain flatter through corners, but at the expense of ride comfort. 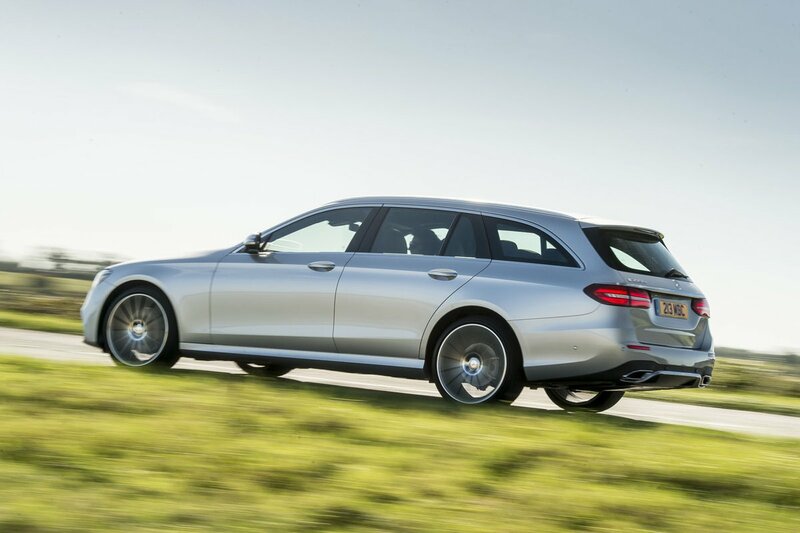 Where the E-Class Estate really scores is its high-speed refinement. That ninth gear – most of its rivals have ‘only’ eight – allows the engine to tick away at a largely inaudible 1375rpm while you're doing 70mph, and wind noise is ever so well suppressed. Only a more pronounced rumble from the tyres prevents it from beating the 5 Series Touring for peace and quiet at cruising speeds. Its handling is less laudable but still tidy. The Volvo V90 in sporty R-Sport trim is more stable and remains flatter through bends than even the firmer AMG Line E-Class models, which roll about more and feel less stable during high-speed direction changes. On the plus side, nicely weighted and precise steering makes the Mercedes easy to place the nose exactly where you intend. The E53 and E63 S versions, meanwhile, feel altogether better tied down. And don’t forget, these full-on AMG models all have four-wheel drive for added traction in the depths of winter. This is something that you can specify on the regular versions, too.